I’m a firm believer in healthy lifestyles, but I’m also a big believer in enjoying the things that make you happy. 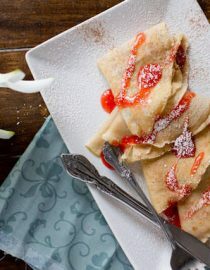 These crepes (crepes are a big time family favorite at our house) were an idea that I’ve had for a long time. You see, we generally take Saturday and Sunday off from working out, and one of those days is usually the day that we enjoy our treats too. But, I hate stuffing my face full of pancakes, or crepes all morning and then feeling kind of guilty about the poor nutritional breakfast that I just shoveled into my mouth. 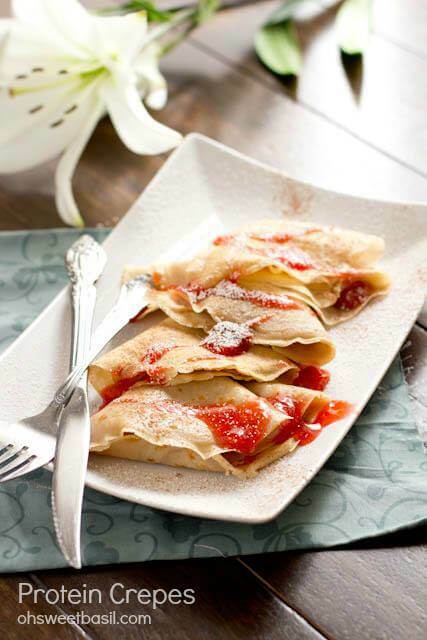 Or, I did feel bad until we made a protein recipe that was not a shake, but protein crepes. 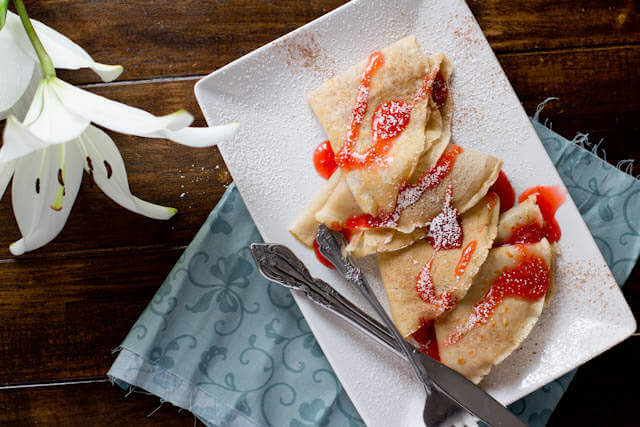 These protein crepes taste exactly like regular, ol’ crepes. Well, maybe not 5 days later. Yeah, that happened. I had sick kiddos and when I finally went to photograph these pretties, I took a little bite and they were a little on the old, rubbery side. And yes, often times the food you see on a blog is leftovers that were set aside to photograph, or dinner photographed in the morning etc. In fact, not only is it crazy how we get the job done, but there’s generally a bigger mess photographing than there was cooking. ANYWAY, the point is, finding new ways to enjoy your favorite meals in a healthier way keeps you happy without feeling like you are dieting or giving up the things that you enjoy. Blendtec Blenders are pretty much amazing. And I mean that. I love that it looks sleek, it’s actually quieter than you think (and I worked at Jamba Juice so I know what I am talking about) and my gosh it functions well. Seriously. We used it 4 times just in the first day that we had it. The motor is amazing. I swear that there’s nothing it can’t handle, which is probably why, “Will it Blend?” rocks everyone’s world. You guys, this thing can even do soup and ice cream. I kid you not. And cleaning? Don’t worry, you just add a little warm water and a drop of liquid soap, bada bing bada bang bada boom you are done! Twister Jar-The newest jar that allows you to blend thick products and create recipes like hummus, nut butters etc. Functionality-Easy peasy. There are setting for batters, smoothies, ice cream, ice, juice etc. Or if you want to control the duration and speed yourself you can do that too. 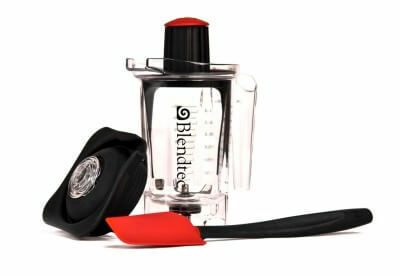 Should I Buy A Blendtec Blender? I know, I could seriously go on and on, and I know that some of you may think you don’t need a blender, but here are my top three reasons why you shouldn’t just want one, but you NEED ONE. You will make healthier food choices- For reals. Sit that pretty little blender on the counter and you’ll find yourself looking for opportunities to use it. Plus, there’s something about having a blender that can make the best green smoothies, and other nutritious deliciousness that you’ll seriously start buying more fresh produce and trying to find better recipes for you. And who wouldn’t want to lose a couple pounds or tighten the flab. Even if you aren’t into smoothies, I bet you’re into food- This blender actually chops, purees, and blends like every blender says it does, but never comes close. We love that we can make cookies, pesto, sauces etc all with a convenient blender. We quickly chop nuts, make fruit leathers, shakes for late night movies etc. Again, you’ll find yourself making the best food ever (they even have amazing recipes for you! Try the tortilla soup and thank me later). You’ll save money- Say what?! Seriously, you will. Start freezing produce as it comes in season, and then make amazing ice creams, soups, smoothies, cakes etc all year round without spending gobs of money on fresh produce. I don’t know about you, but our old blender just tossed frozen fruit around with little nicks on it. Total waste. We had no choice but to use fresh fruit, and as we all know, frozen fruit makes a thicker smoothie which is what I like. Plus, when you finally can make a crazy good pesto pasta at home there’s no need to eat out which keeps more money in your pocket. You. are. welcome. Pancakes and crepes are not the same thing. Pancake batter has a raising agent in it, such as baking powder or baking soda, and crepe batter does not. Therefore, pancakes are thicker and fluffier than crepes, and have a different flavor and texture. Protein powder is generally safe and can help you build muscle and strength, lose weight, reduce your appetite and boost your metabolism. Protein shakes can be used as a meal replacement. However, a person does need to eat complete meals also. Protein shakes really should only replace one meal a day. In a bowl, whisk together the flour, protein, sugar, and salt. In a blender, combine eggs, milk, and vanilla. Mix and add the flour mixture into the egg mixture and add the butter, whisk until just smooth. Heat a skillet over medium heat. Spray with non stick spray or melt a little butter. Add a scant 1/3 cup of the batter, picking up the pan to swirl in a clockwise motion to coat the entire bottom. Let cook until just starting to brown and then using a rubber spatula carefully flip the crepe. Cook on the other side until just starting to turn golden. Serve with fresh fruit and a little powdered sugar.